My starter has been living in the fridge since its creation, but last week it decided to die for some reason. Fortunately, I had some dry starter chips in the fridge, which I could revive and after two feeds the "new" starter was good to go, very active. I hydrated the dry chips for 4 hours, and then fed it twice over the next 20 hours. Notice that I used tap water directly and things worked out fine. I believe the tap water here does not have a lot of chlorine. 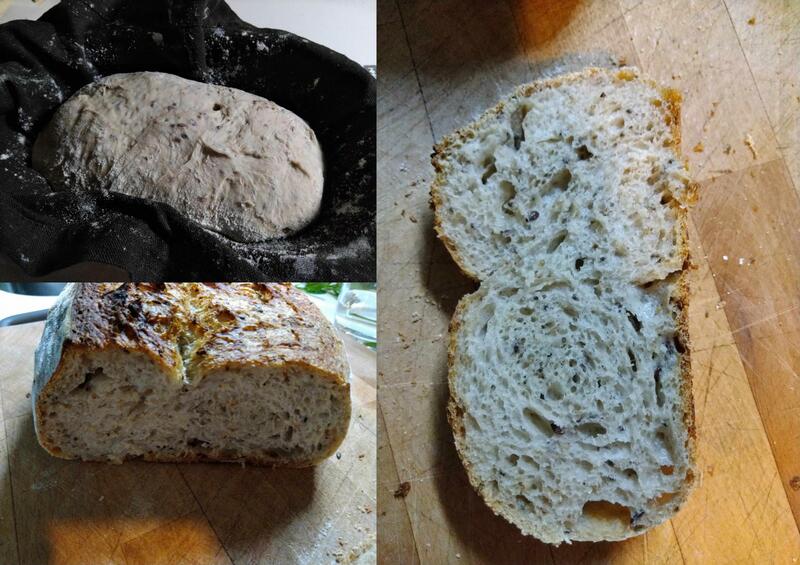 Baked a loaf made of 67% white + 33% mixed whole wheat and rye flour at 68% overall hydration and 9% fermented flour. I also added some 10% mixed seeds for texture (flax, quinoa, chia), which were soaked in cold water for about ten hours. Very pleased with the crumb and crust. The loaf had an explosive oven spring, tearing apart the scoring slit from side to side as never seen before in my loaves. I just spread some starter on parchment paper and let it dry for 2 or 3 days, then broke into pieces and stored in the fridge in a container. I have done it three months ago. much less doing tiit on purpose. Very nice for a throw together with a new starter - all the way around! with a fantastic oven spring. Yep, at times when I go away for an extended period, I refresh my 60% rye starter (lasts for months in the depths of the refrigerator), freeze some of my 75% mixed flour starter, and dry some of it on parchment to be chipped and placed in a container. It will last for years in this dry dormant state. I've also relied on it coming back to life, and as you found out, it does so very nicely. It is also a good way to transport starter for distances and to ship some to friends far away. And it doesn't come any more cheaply than that. Thanks for the comments. I was not sure about freezing it. Thanks for the sharing. Fresh milled flour: sifted or not?